Trump Border Wall National Emergency Declaration-The Facts! Congress Doth Protest To Much! Confused by all of the so-called legal analysts on TV, including the sour grapes Judge Napolitano on Fox, (Napolitano apparently is holding a grudge as Trump picked Kavanagh over him) regarding the possible Emergency Declaration by President Trump to fund and build-out the wall on the Southern Border? Then you get to listen to all of the Congress men and women, who know virtually nothing about federal law and the US Constitution (scary thought), say that Trump would be setting bad precedent, and the funding and build-out of the border wall is solely within the power of Congress or that this action by the President would be met with lawsuits and is a “fool’s errand”. Terrorists, Gangs, and Criminals Arrested: 3,755 Known Terrorists; 6,000 Gang Members; 17,000 Adults with Existing Criminal Records; Criminal Organizations Make $2.5 Billion in Profit Each Year from Migrant Smuggling! Rise in Vulnerable Populations Overwhelming Resources: 60,000 Unaccompanied Children-Increase of 25%; 161,000 Family “Units”-Increase pf 59%; 2,000% Increase in Asylum Claims even though 72% do not qualify for Asylum! Over 2,000 Persons Per Day (730,000/yr annualized) are Captured at the Border. These cannot be deported because of “Catch and Release”. Depth of Humanitarian Crisis at Southern Border: 50 Migrants/Day Referred to Medical Providers; 4,300/Yr People in Distress Rescued by CBP; 31% of Women Sexually Assaulted on Journey; 17% of Men Sexually Assaulted on Journey; 70% of Migrants Traveling are Victims of Violence. So, Congress has an “Aw Shi#” moment. Their original law granting the President far-reaching emergency powers included the provision that the House could pass a resolution by simple majority and the Senate could affirm the resolution by simple majority and the President COULD NOT VETO THE RESOLUTION DECLARING HIS EMERGENCY DECLARATION AS VOID. To bad for Congress, the pesty Supreme Court ruled in 1984 that the President had CONSTITUTIONAL powers to veto any Congressional Legislation, including this act, and that Congress could only THWART THE VETO BY A 2/3rds VOTE OF BOTH HOUSES! So, if President Trump declares that the Southern Border is an emergency and poses a threat to American Sovereignty, and/or, it is creating a humanitarian crisis, and/or it is endangering Americans by flooding drugs into our communities, and/or, it is promoting human trafficking, the House and Senate would have to have enough votes to overturn a Trump Veto if they attempt to invalidate his declaration! Further, Congress has passed laws that allow the President to tap the military to design and contract for the wall and that any “Such projects may be undertaken only within the total amount of funds that have been appropriated for military construction, including funds appropriated for family housing, that have not been obligated.” Will the Democrats sue? Absolutely! Those that claim Trump should not issue the declaration as it would set a bad precedent are too late. Congress has already lost this battle by “self-emasculation” via their own legislation. Obama has already used non-existent executive powers to rewrite immigration law and granting status to DACA recipients. Any good Left-Wing Progressive cares less about precedent! In terms of the declaration itself, since Congress passed the law, it would have some level of standing (the right to sue as an aggrieved party) and attempt to invalidate the President’s declaration. But, CONGRESS BUILT INTO THE LAW THE METHOD WHEREBY THE CONGRESS COULD CHALLENGE THE PRESIDENT VIA RESOLUTIONS THAT ARE SUBJECT TO A VETO! The Democrats in Congress could file a suit to invalidate the declaration, but it would probably not be upheld by the Supreme Court as Congress gave up their standing within their own legislation! 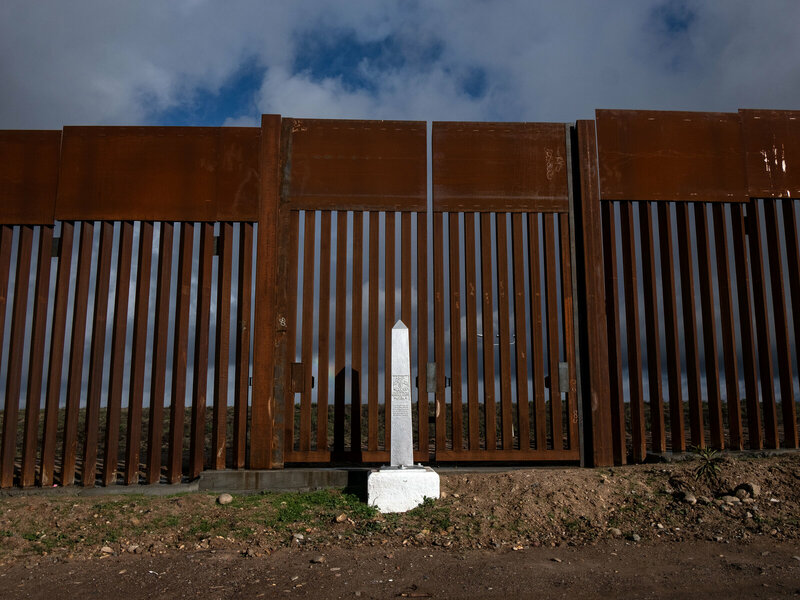 Eminent Domain: Some argue the landowners along the border who have not sold or granted access easements to the Federal Government where the wall would be built, would have standing to sue the Trump Administration citing the National Emergency Declaration as being harmful to the value of their real and personal property. BUT! The procurement of these lands is subject to negotiation or legal proceedings via Eminent Domain. The latter action and procedures are subject to their own statutes and remedies and do not necessarily provide standing against the National Emergency declaration. The Federal Government would either have to negotiate access rights or an outright land purchase from such landowners or use Eminent Domain to procure the land. While the landowners may sue citing the declaration, there is a slim chance the Supreme Court would deem their standing valid. Once Trump issues the emergency declaration, the lawsuits will start. A Democrat Friendly Federal District Court would probably issue a cease and desist order against the declaration that would be immediately challenged by the Trump Administration. If the challenge does not cause the Federal Court to reverse the injunction, the Administration would appeal the lower court decision. The first action would have probably been filled within notorious the 9th District. The 9th District Court of Appeals would probably uphold the lower court’s injunction. The Administration would have to then appeal to the Supreme Court. The Administration could appeal the original decision directly to the Supreme Court, by passing the appellate court, but they tend not to short-circuit the appeal process through the lower courts. This process could take anywhere from 3 months to two years! But, the Army Corps of Engineers could begin the design of the project; the property procurement could commence; and contacts could be developed. It is doubtful that the Administration would drop everything and wait on the lawsuits! Trump, and his supporters, don’t have much to lose. The Democrats are not going to fund the wall at this point and may not up through the 2020 elections. At least declaring an emergency could get the ball rolling and Trump has enough discretion to begin the process. Right now it is a game of chicken and we will see who blinks first. Trump is looking for existing funding within the impacted agencies to make payroll. If he does this, he can pretty much wait out the Democrats! He already appears to be the only adult in the negotiations as Chuck and Nancy have only sat on their hands. Time will tell. Previous PostRINOs and DIMMS, Diarrhea ProblemNext PostWere Martin Luther King Jr. and Cesar Chavez Racists? Obviously Not! Rep. Steve King?